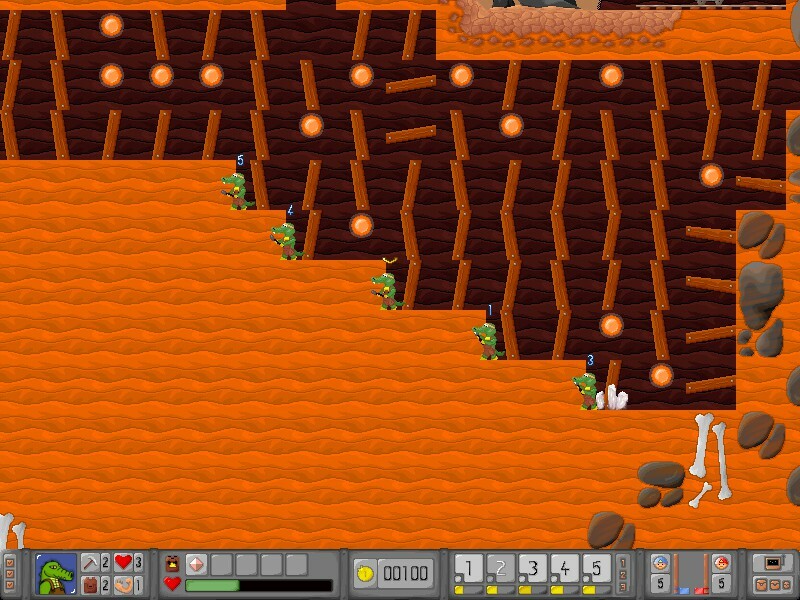 The Miners is a game inspired by Diggers - one of the best Amiga games released in 1993 by Millenium. 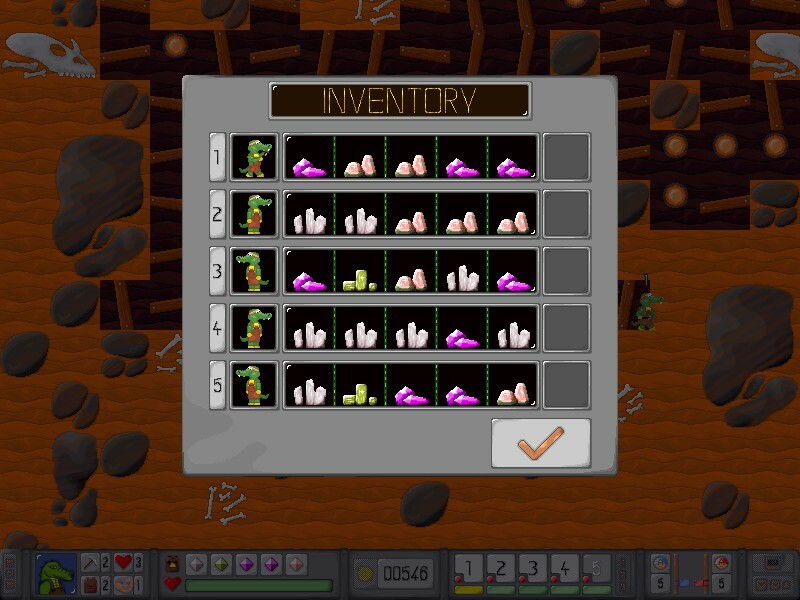 Player leads team of 5 miners, who mines deeper and deeper for precious gems and other treasures. Excavations are performed on a small, but very rich in raw materials, planet called Morg. It is a perfect place for mining. Varied topography and beautiful scenery encourages for digging. Unfortunately, all what they mine is owned by The Mine. Suddenly, one day, owner of all mines on the planet, announced competition for the best mining team. Winner will receive the first prize - one of the richest mines on the planet! Additionally, that they will keep for their own all treasures found during competition. Why dig a whole life for someone, like you can dig for yourself and increase your treasury? However, victory will not come so easy. You will have to beat other teams, and watch out for many hostile creatures who live in the caves. You will also have to cope with the mines itself, as they are placed in really wild and inaccessible places. Luckily, competition rules allows to use advanced mining tools. Don’t waste your time and send your application to the competition today! Game has created special website on Google+ and Facebook. If you will like this project please use “+1” and “Like” buttons and share it with your friends. For those who does not know / follow my project I will take this opportunity to say few words about it. Come and try officially released game demo. Dig some tunnels, look for treasures and become rich. Finally I submitted my game to Steam Greenlight. Please visit it and vote! Game is finally finished! Come and see latest official trailer of my game! I successfully removed last known bugs, that I couldn't solve for a long time. I have also increased game performance thanks to really simple solution. So glad I was subscribed to your blog all this time. I hoped this would become available :-) Stumbled upon this by chance and so happy to see it in it's final stages! I'm running Linux, fingers crossed you would consider a SteamOS version, otherwise this is going under WINE. Looking forward to another update for the GreenLight page and its inevitable release! Thank you for good words! Hope we all will soon see this game available on Steam :) I have put lot of work into this project, and I'm really satisfied with the final effect. I have a feeling it may work on wine. When is it going to be released? It looks great. This looks amazing, I like it! Haha, oh my, what a game-play, lovely. OMG OMG OMG !!! I love you ! I've been a fan of Diggers / Diggers Xtractors forever and I never saw anybody coming back with such a great idea for a game anymore ! Thank you for doing this ! Definitely tracking it ! Will you include lots of gizmo machinery like in the 2 diggers and other ones of your own invention ? Really looking forward to this ! Is it the definite graphic style ? I liked the darker style of diggers, yours is quite bright right now. Anyway, thanks a lot ! Yes, graphic that are presented here, are final. I know it's style is different from original Diggers, and I did it on purpose. I didn't want to create just a remake of a game. I wanted to recreate one of my favorite Amiga games "on my way". For example keeping graphic in cartoon style. Re your question about machinery. 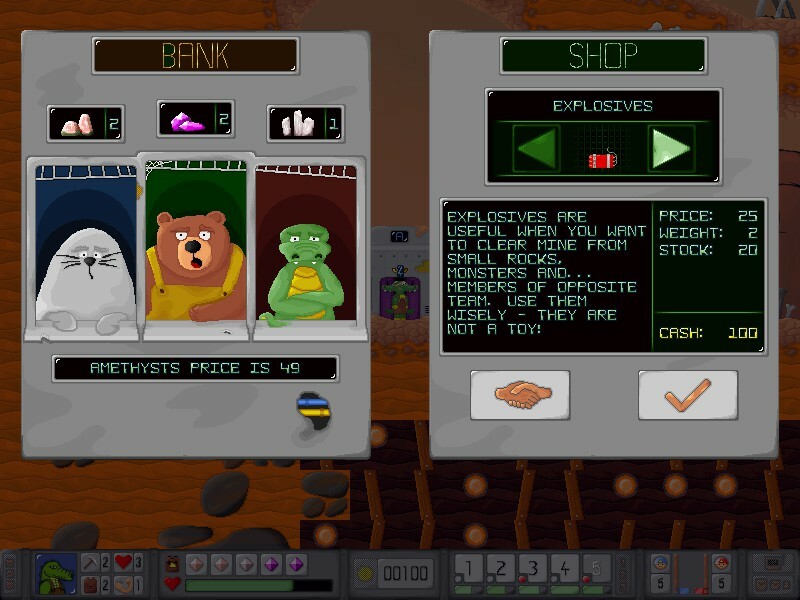 Well, there will be some stuff to buy and use in the game, but not all items from Diggers will be implemented. Most of items, that were put there were unnecessary (in my opinion). For example bridge - maybe I used it twice for a whole game. Flood dam? Completely pointless. Map? Also (never used it). Explosives? To be honest, there wasn't anything to blow up with them (maybe opponent if you were lucky and he didn't teleport). The best of course were both tunnellers. Looking at them, while they made their way through dirt was really fun. But while using them over longer period of time, they were causing more problems than fun and benefits. For example, I replaced them with "advanced" and "expert mining tools". Miners who holds them in his backpack mines better (faster). Disadvantage is that, that they reduce miner carrying capabilities.